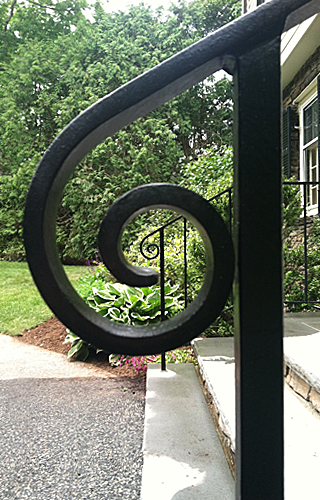 With over 35 years of experience, we can create a modern or classic look for your property with metal fabrication. Norfolk Iron Works Inc. provides custom solutions for all your fabricated metal needs. From stainless and aluminum to steel and bronze, we work with various metals and have extensive expertise in both commercial and residential applications. Services include design, fabrication, and installation of railings, fences, stairs, and light structural steel work for both interior and exterior environments. We pride ourselves on — and guarantee — quality workmanship and timely installation at an assured price. For each job, we provide written proposals. We do high quality work without taking shortcuts. We do a neat job so you won’t have to clean up after us. Pricing depends on the time the work takes because we only do custom work. However, our prices are competitive. There are no gimmicks. Notes from our customers about recent projects . . .
Nick — The railings look great. Maureen’s very happy with them. Neighbors have also been over to see them. They complement the granite steps very nicely. Thank you so muchh for finishing our job in such a timely manner. The railings look great and add a lot to the look of the house. Thank you for the installation of my railings. The young man did an excellent job. I am very pleased!